IELTS table academic writing task 1: Writing about a table. Tables sometimes show up in academic task 1 writing, so you need to be prepared just in case you get one. You will need to use the language of comparisons in this case. The most important point to remember with academic task 1 writing is that you have to be selective, especially if there is a lot of data in the chart, graph or table. This means that you do not write about every piece of data. Grouping the data is another key skill that is needed here. Here is an example of a table. How would you answer the questions below this table? How would you paraphrase the introduction? What would you put in the overview? What tense is going to be used to describe the data? What information from the table stands out? Are you going to use language of change? or comparisons? or both? Is it possible to group the information? Let’s take a look at how we would answers these questions now. The model answer for this table is at the bottom of the page. For the writing tasks in IELTS, you always need to re-write the introduction in your own words but keep the same meaning (paraphrasing). You will need to have good vocabulary for this, but not everything needs to be paraphrased. In this particular task it is pretty straightforward. Using synonyms and changing the sentence structure are two ways to paraphrase successfully. Having an overview for academic writing task 1 is very important. In the overview you need to summarise the trends or main features in the chart, table, graph or map. You have to be selective here if the table has a lot of data. Do not write about everything. Pick out the main features. Do not mention percentages, detail or numbers here. it’s really an overview of the table. The place for the details are the main body paragraphs. Just remember that there should never be a conclusion for academic task 1 writing. I chose 5 cities here. London and Paris the oldest underground train service, LA the newest , Tokyo the highest passenger numbers and Kyoto the lowest amount of passengers and shortest kilometres of route. I used the phrase ‘the turn of the 21st century’ to paraphrase 2001. I picked out 4 main features here and compared them. I was selective and didn’t go into detail nor did I go into any detail about numbers and data. I used the language of comparison here: the oldest, the highest, the lowest, the shortest. 3. Which tense and what grammar will be used? The main tense in this case is the present tense and the passive voice, highlighted in red. 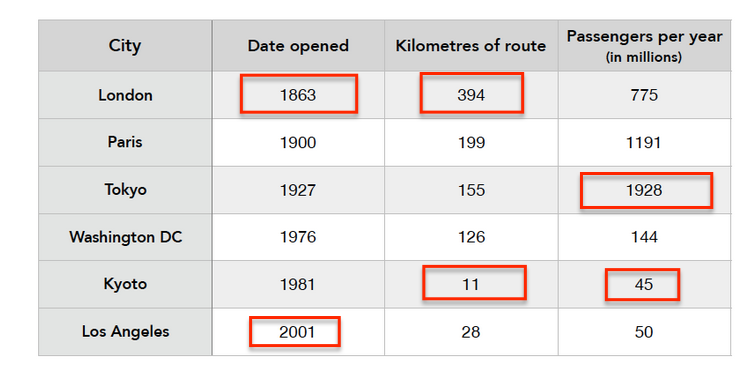 We will be comparing the cities and passenger numbers as well as kilometers of railway. Comparatives and Superlatives must be used in the body paragraphs which I have underlined in green below. ‘The London underground is the oldest network, which opened in the mid 19th century. It is also the most extensive with 394 kilometres of route. The railway system in Paris was opened in 1900 and is approximately half the size and serves more passengers. Tokyo’s system is the busiest with 1928 million passengers yearly, however, when compared to London, it has a much smaller route at 155 kilometres. This model is still a bit long so I could cut it down to about 170 – 180 words. There are also some relative clauses here which are seen as complex sentences. Los Angeles, which opened in 2001, has 28 kilometres of track and serves 50 million passengers per year. 4. What information stands out? The age of the networks: London being the oldest and LA the newest. Kilometres of route: London the mos,t Kyoto the least. Passengers per year: Tokyo the most, Kyoto the least.These are key pieces of information that must be included in the body paragraphs. You can also compare this information to the other cities by using the language of comparison. I can see from the table that there are 3 cities with railway systems that are very old (London, Paris , Tokyo) and 3 cities have a newer system ( Washington DC, Kyoto, LA) so I will use those groupings in my body paragraphs. Always take time to analyse the chart or graph in task 1 and decide how you can group the information, this is a crucial skill in IELTS writing task 1 and will help you get a better band score. 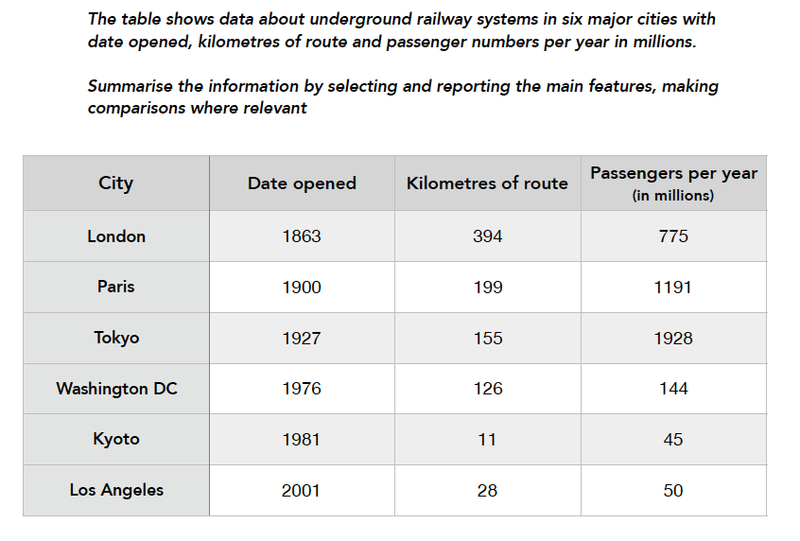 The table illustrates data regarding underground railways from six large cities in various parts of the world, showing year opened, kilometres of route and yearly passenger numbers in millions. Overall, London and Paris have the oldest underground train system in the world, compared to Los Angeles, which is relatively new. Passengers for Tokyo are the highest, in contrast to Kyoto, which has the lowest number of yearly passengers and the shortest route. The London underground, which opened in 1863, is the oldest network. It is also the most extensive with 394 kilometres of route. The railway system in Paris, which was opened in 1900, is approximately half the size and serves more passengers. The underground in Tokyo is the busiest of the three with 1928 million passengers yearly and 155 kilometres of route. Regarding the three other systems, Washington DC has the longest route of the three, in contrast, Kyoto has only 11 kilometres of route and the lowest passenger numbers of all the cities with 45 million passengers yearly. Following this, Los Angeles, which opened in 2001, has 28 kilometres of track and serves 50 million passengers per year. Tip: Word count should be in the range of 160 – 190 words in academic writing task 1, because you do not get extra points for a very long task and you just won’t have the time, you will have to write this in 20 minutes. Balancing your opinion in an IELTS essay.